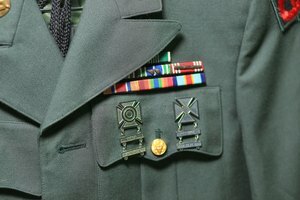 Placement of Army awards (medals, decorations, badges, ribbons) on a Class A uniform is very specific in order and location, as described in Army Regulation AR 670-1. Proper order and placement on the uniform is essential to avoid disciplinary action. Gather all of your awards. Make sure your award holder is the appropriate size to hold all of your awards. Different sizes of award holders are available. You don't want bare metal to show. You'll need to keep buying new sizes as you earn more awards. Put the award holder on a flat surface in front of you, facing up with the pin underneath. Begin by placing the lowest-ranking award furthest right. 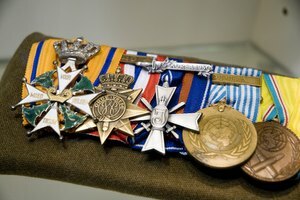 Add additional awards in the order of their ranking to the left. If you have more than three awards, add another award holder above the first row. The highest-ranking award should be on the highest row, furthest to the left. If there is a row with only one or two awards, make sure you have an award holder that has a single or double award row. These award holders are designed so that the single or double awards will be automatically centered above any rows with three awards. Using the ruler, center the award holder 1/4 inch above the left breast pocket. 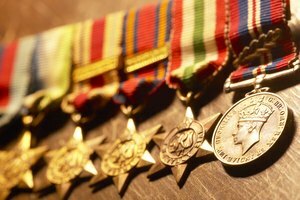 Once the award holder is in place, push the pins through the uniform and secure the award holder to the uniform. 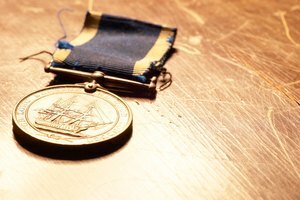 Double check the position of your award holder to ensure it is centered above the left breast pocket and is 1/4 inch above the pocket. Dilloway, Margaret. 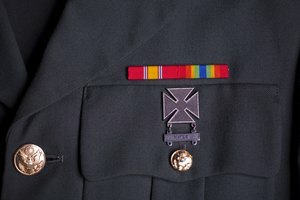 "How to Place Army Ribbons on a Class A Uniform." 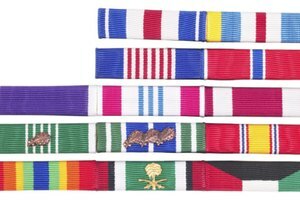 Synonym, https://classroom.synonym.com/how-to-place-army-ribbons-on-a-class-a-uniform-13583437.html. 04 October 2017.